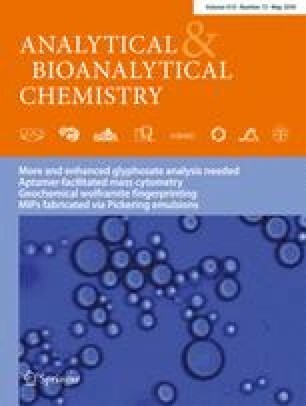 Novel molecularly imprinted polymers (MIPs) based on denatured casein nanoparticle (DCP)-stabilized Pickering emulsions were developed for the first time. Casein, a phosphoprotein, is the main protein in milk. In this work, DCPs were solely used as Pickering-type interfacial emulsifiers for fabrication of MIPs for the selective recognition of proteins for the first time. DCPs were prepared by acidification and heat denaturation (at 80 °C) of casein. Their dispersions have satisfactory colloidal stability over a wide pH range. The DCPs acted as natural, food-grade, and edible interfacial emulsifiers, and adsorbed at the oil–water interface to form Pickering emulsions. After the polymerization of monomers, the template protein was removed by elution. During the elution, the interfacial DCPs were also removed, allowing more imprinted cavities to become exposed. The interfacial imprinting technology causes nearly all the imprinted sites to locate on the surface of the polymeric material. Therefore, the MIPs obtained exhibit fast rebinding and excellent specific recognition ability toward the analytes. Overall, this work provides a promising method for designing and fabricating natural-protein-based structured emulsions to prepare MIPs and thus offers new insight into protein separation and purification. Pickering emulsions stabilized by denatured casein particles. The online version of this article ( https://doi.org/10.1007/s00216-018-1006-x) contains supplementary material, which is available to authorized users. This work was financially supported by the National Natural Science Foundation of China (no. 21576295) and Hunan Provincial Innovation Foundation for Postgraduate (CX2017B043).